Well, they did it. They came up with the worst possible “replacement” for the Affordable Care Act. The horrific plan that the House Republicans passed on Thursday threatens not only the health insurance of 24 million people, but those of us lucky enough to have employer-provided health insurance, anyone covered under Medicaid, and anyone who ever dreamed of leaving the security of an employer to start their own business or otherwise follow their dream. Not only did they throw the baby out with the bathwater, but they buried her 10 feet deep in a remote spot in the Amazon. Um, Mr. President, everyone knew. In fact, health care is considered the most complex industry out there. 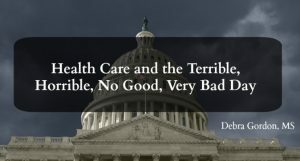 That would be why, as you and your colleagues are finding, transforming the system is “incredibly complex.” It is also why it will be nearly impossible to repeal-and-replace the Affordable Care Act (ACA) with something better unless you move to a single-payer system.You can, of course, focus on fixing its weaknesses. 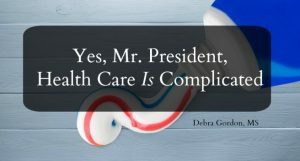 The past 30 years as a healthcare writer have reaffirmed that statement hundreds of times over. 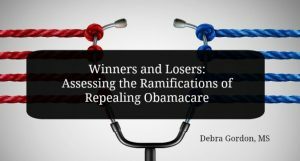 After voting at least 60 times over the past six years to repeal the Affordable Care Act (ie, Obamacare) only to see their efforts stymied in the Senate, the Republican House is fairly foaming at the mouth at their golden opportunity to reach Nirvana now that they also control the Senate. Indeed, the Senate passed a budget resolution on January 4 to begin the process, instructing the House to have a repeal bill ready by January 27. You can read how this might work in this excellent article in The New York Times. There’s just one problem: Despite the six years they’ve spent trying to kill the ACA, the Republicans still have no replacement. So here’s just a sneak peek at what might happen if they follow through on their threats. We now interrupt our regularly scheduled programming to bring you a wonky blog post. So a few people out there are suggesting that we privatize Medicare and give out vouchers for recipients to purchase their own insurance on the open market. This is such a bad idea for so many reasons, and shows that some people simply don’t understand how Medicare works. Here are my top five. . .
1. Medicare is the closest thing we have to a single payer system. Medicare covers one in seven Americans, 97 percent of those 65 and older., or 49 million Americans. In 2030, the number of Americans covered is expected to nearly double, with one out of five Americans covered. This huge cohort of individuals provides enormous opportunities to test new reimbursement and quality initiatives with a large cohort. In fact, Medicare is leading the country in many of these initiatives, including accountable care organizations, pay-for-performance options, DRGs for hospital reimbursement (which reimburses based on diagnosis, not on how many aspirin you get), and financial penalties for hospitals if patients with pneumonia, heart failure, or heart attacks are readmitted within 30 days. Those penalties are expanded to vascular surgeries/procedures in 2015. Messing with Success: Leave Medicare Alone! I’m listening to the news at the tail end of a beautiful Friday afternoon and I am so angry I could spit. I just heard about the new budget plan passed by the House which calls for requiring Americans 65 and older to use “vouchers” to purchase private health insurance in 10 years and works to dismantle one of the most successful healthcare programs in the world — Medicare. Yes, you heard me right, Medicare. Because the reality is that Medicare does a pretty decent job of covering core health care needs of a large component of American society and, because of its size, is the only health insurance program in the country that can literally change how medicine is practiced through its policies. 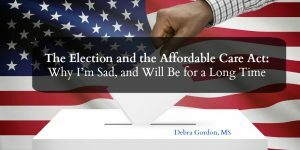 Public Option, Medicare, What’s the Difference? Warning: This is one of those “policy” posts, so if you’re looking for pithy freelance medical writing verbiage, come back tomorrow. If you’re still with me, you know that the Senate begins debate today on the healthcare insurance reform bill (apparently we’re no longer calling it “healthcare reform” because there’s still so far to go in terms of reforming the overweight, out-of-control, drunken healthcare system we’ve created over the past 50 years). One of the big sticking points to getting a bill passed in the Senate, pundits say, will be the so-called “public option.” This component provides a bare bones, government-sponsored health plan, subsidized as needed based on income, to compete with private health insurance plans. The plan would be delivered by private insurers paid by the federal government. In the Senate plan, states would be able to opt out of it if they wanted. Nonpartisan estimates from the Congressional Budget Office show that just 4 to 6 million Americans would go for it. Oh, and it would save billions over 10 years. Yet based on the reaction from most Republicans and some Democrats, you’d think it was a proposal to cut off every American’s right arm!